23 Karat Double Roll Gold is made from genuine 23k double gold loose leaf, placed on a tightly wound roll of transfer paper. The rolls are 67 feet (20.4 meters) long, and available in a variety of widths from 1/4” up to 3" wide. 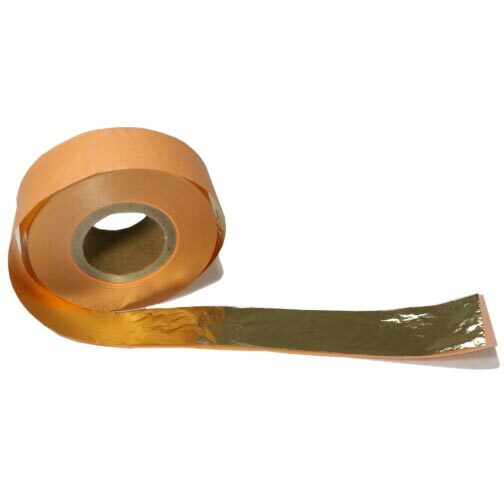 Roll gold can save a great deal of time by allowing you to unroll the gold on to the prepared surface, rather than placing a series of individual leaves. It is ideal for gilding long stripes, large surfaces, and architectural installations. “Double” is an industry term indicating that the gold is about 20% thicker than regular leaf. Double gold has better coverage and increased durability when compared to standard leaf. Please contact us by phone at 888‑853‑3672 for special pricing on more than 10 master rolls (3" wide x 67' long, each), or for information about custom rolls. Rolls can be cut to custom widths. 23k Double Roll* 67 feet in each roll. Please contact us for custom widths up to 3". * Double gold leaf is about 20% thicker than regular gold leaf.